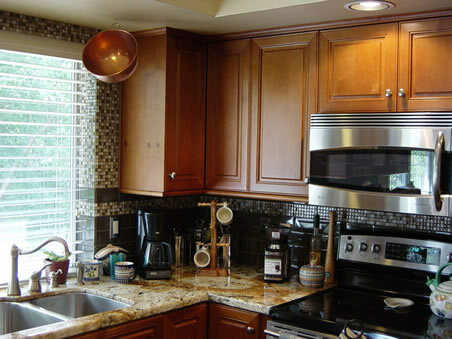 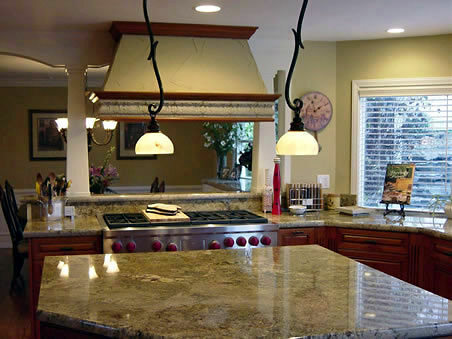 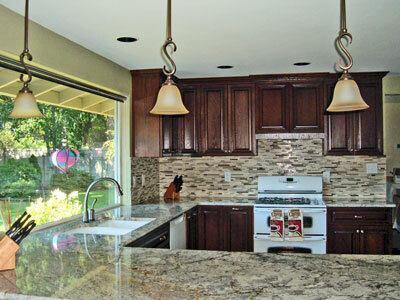 Home remodeling professionals realize what an important room the kitchen is to a family’s home. 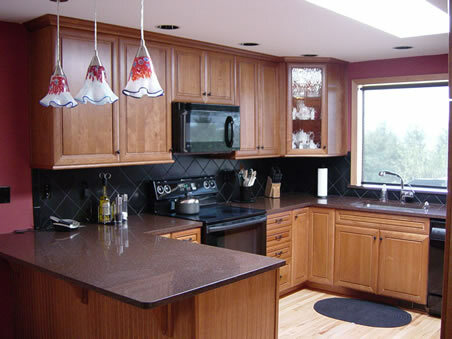 In many households, the kitchen is the heart and soul of the house and is used for a multitude of activities. 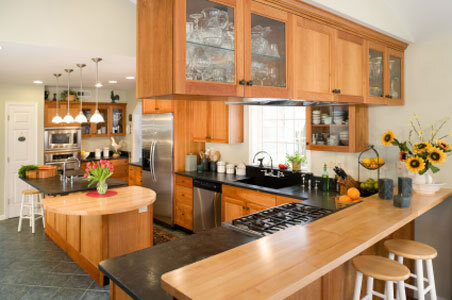 Everything happens in the kitchen, from preparing and eating family meals, to household gatherings and entertainment. 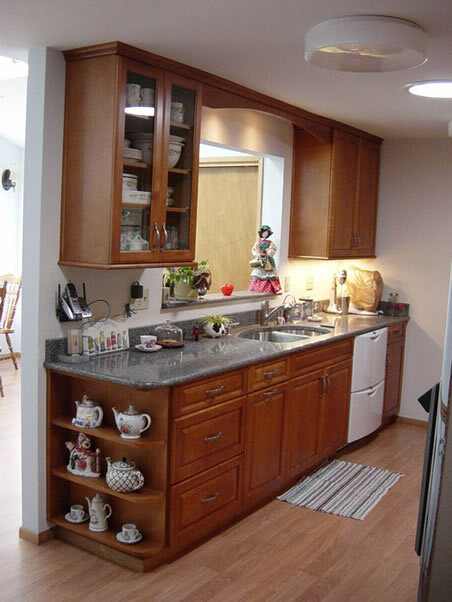 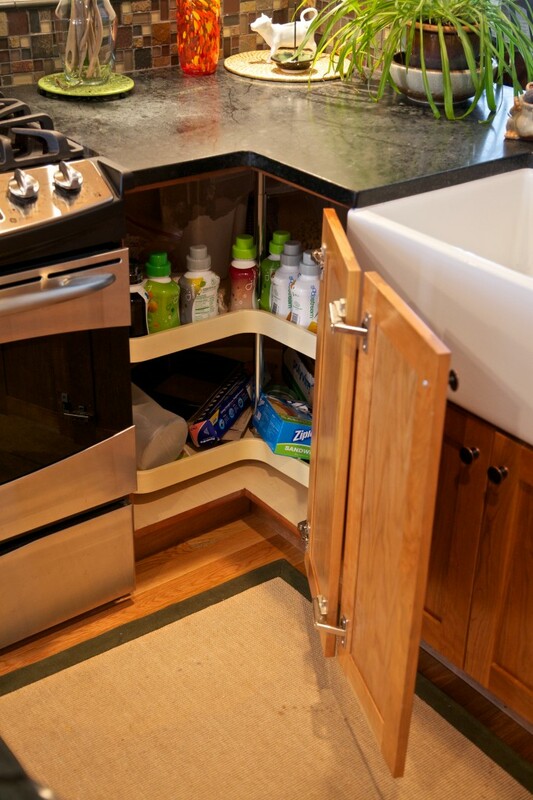 Clearly, it is one of the most used spaces in your entire home. 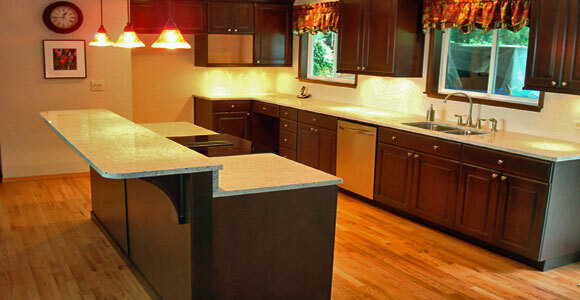 That is why your kitchen should have a design that fits your household’s tastes and particular needs. 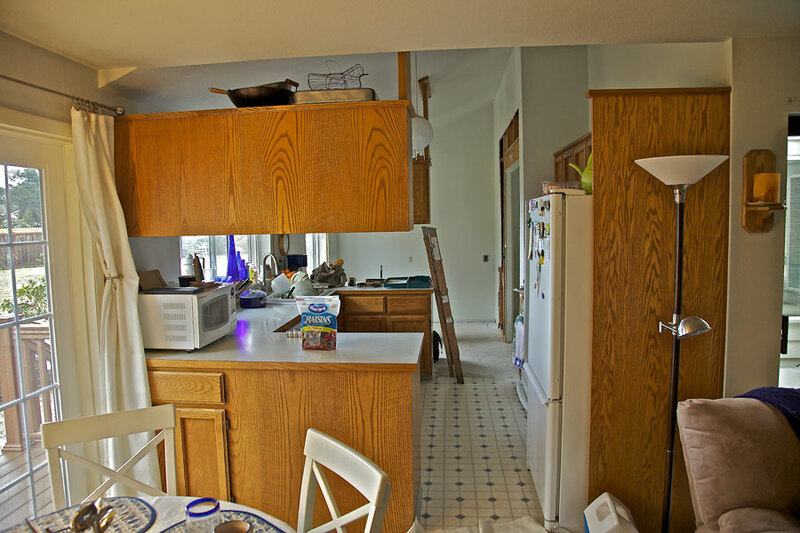 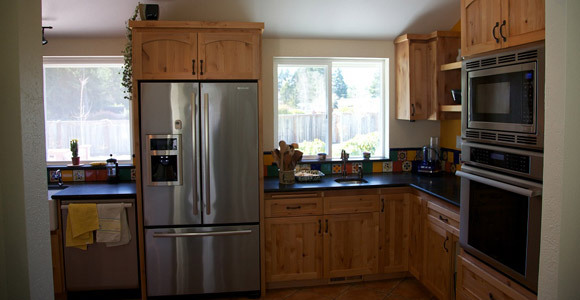 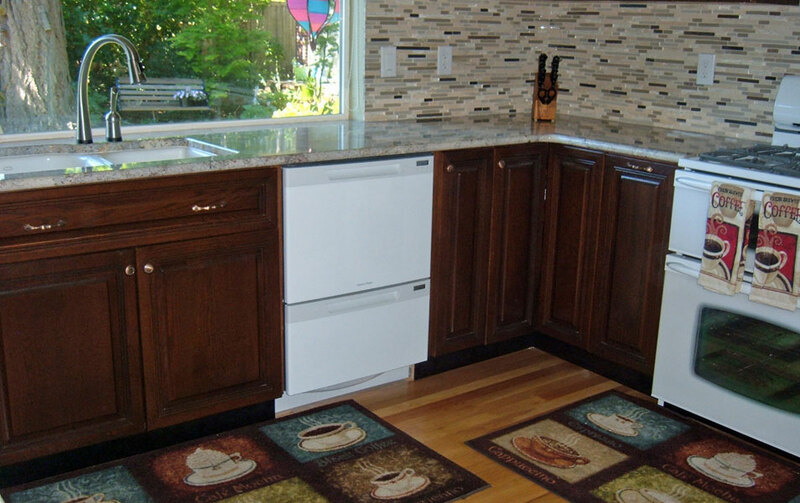 Here is a picture of our latest kitchen remodel project. 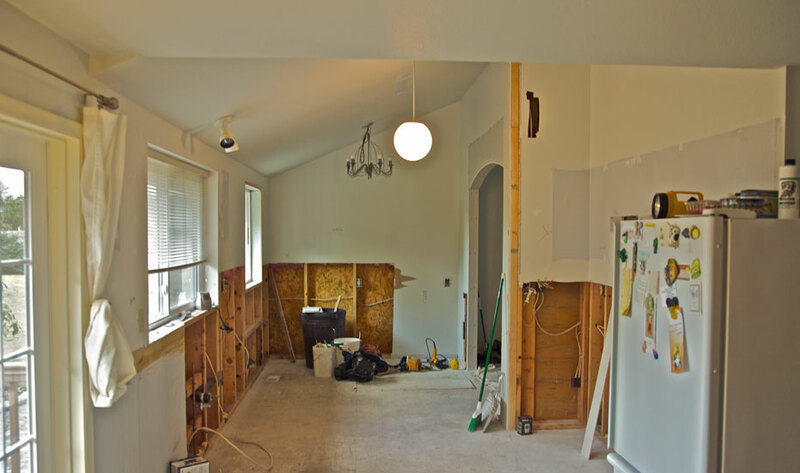 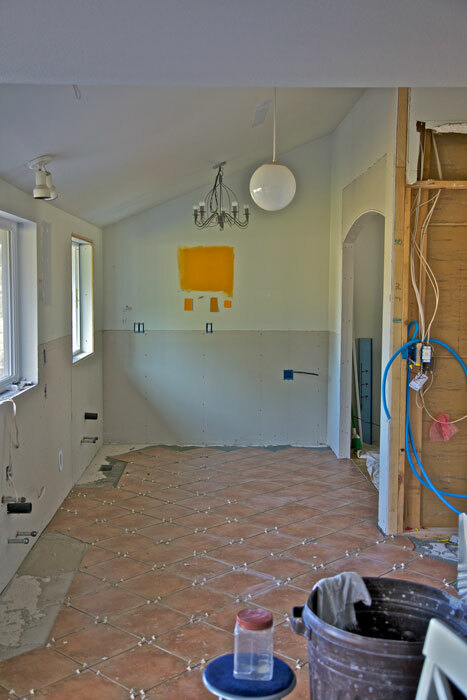 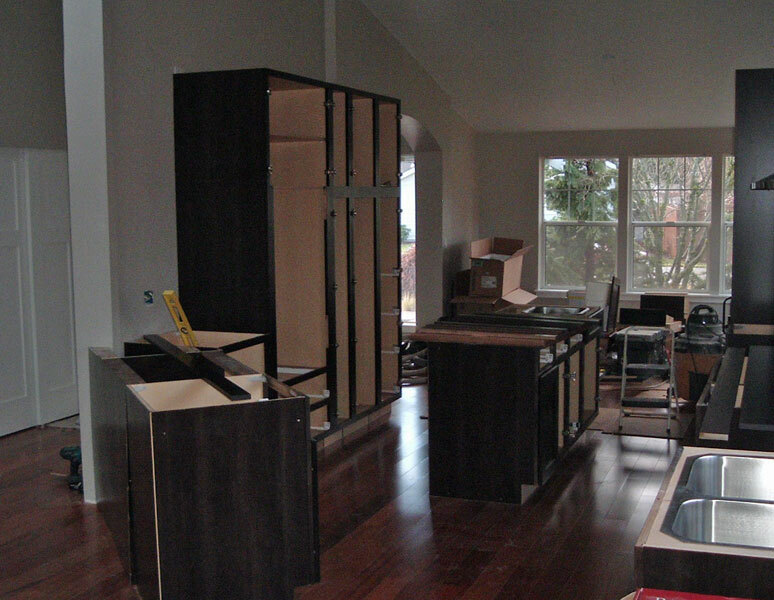 To see the whole job from start to finish, be sure check our our Remodel Process gallery. 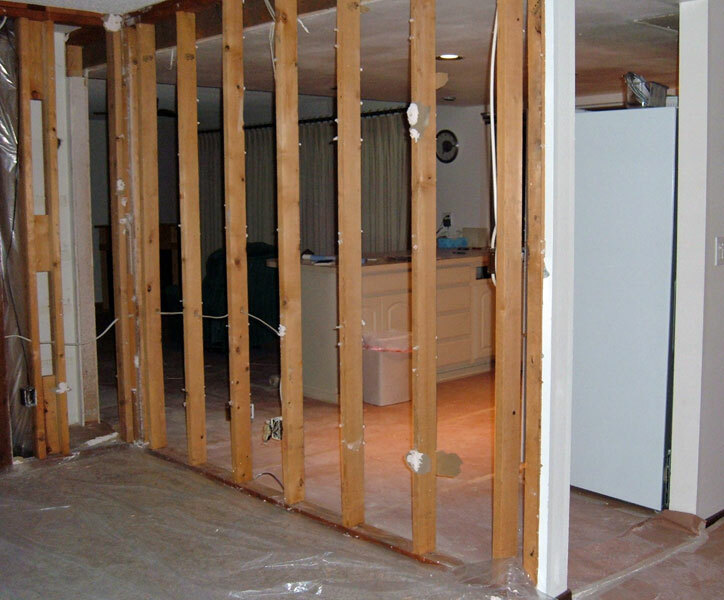 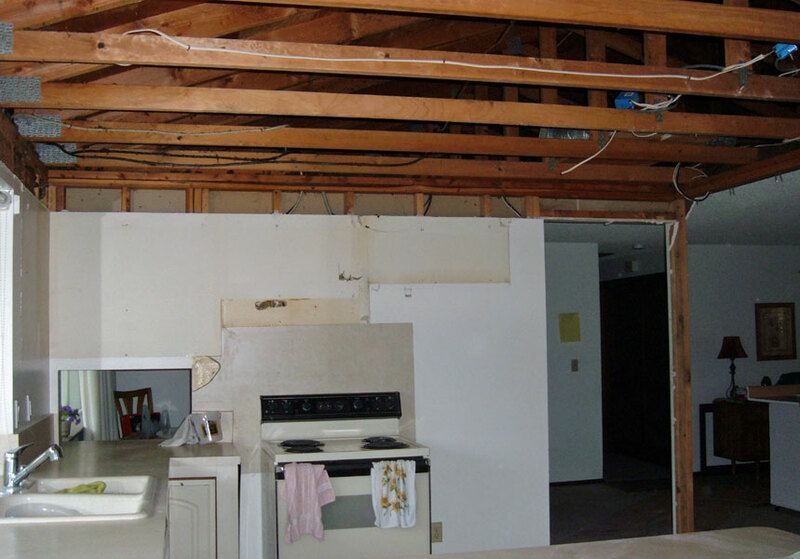 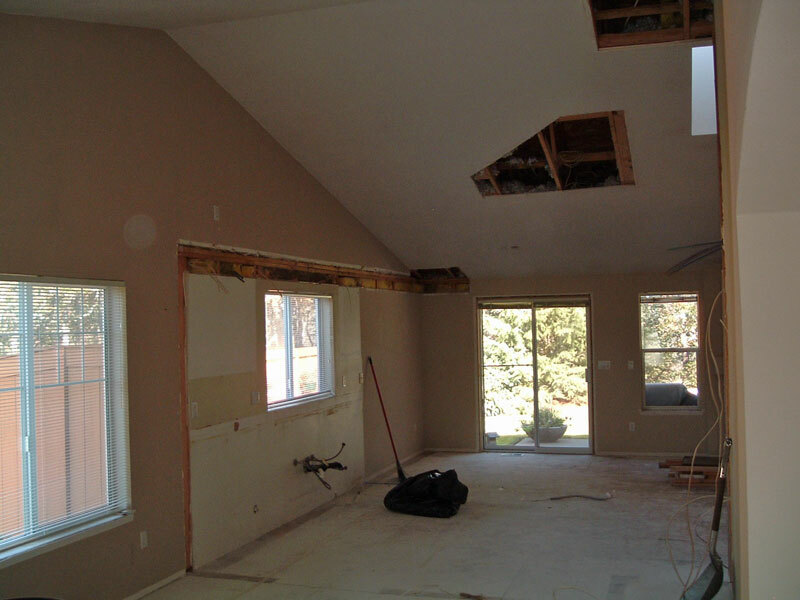 This project required the removal of many walls and soffits. 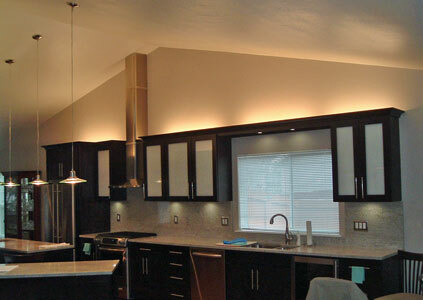 A 1980s house that was cut up into many small spaces, was gutted and turned into a modern open concept home. 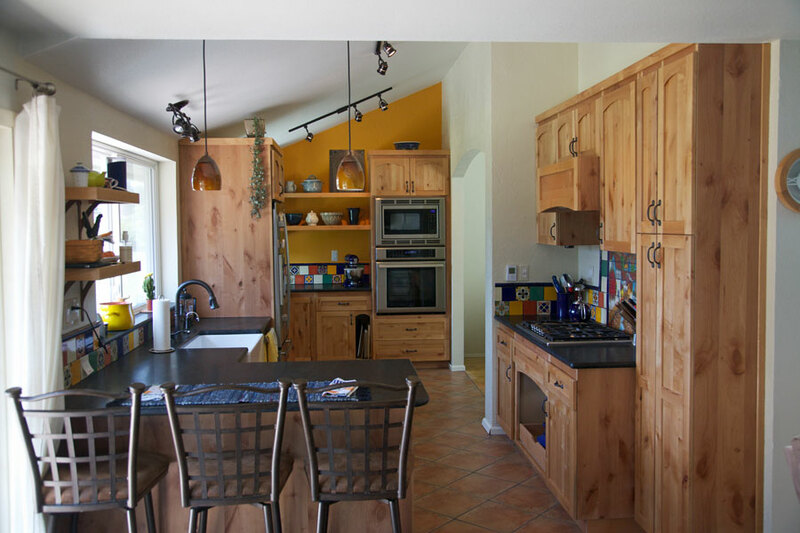 The Kitchen, Dining, and Living spaces all share in the open feeling of the tall cathedral ceilings that are a feature of this homes architecture. 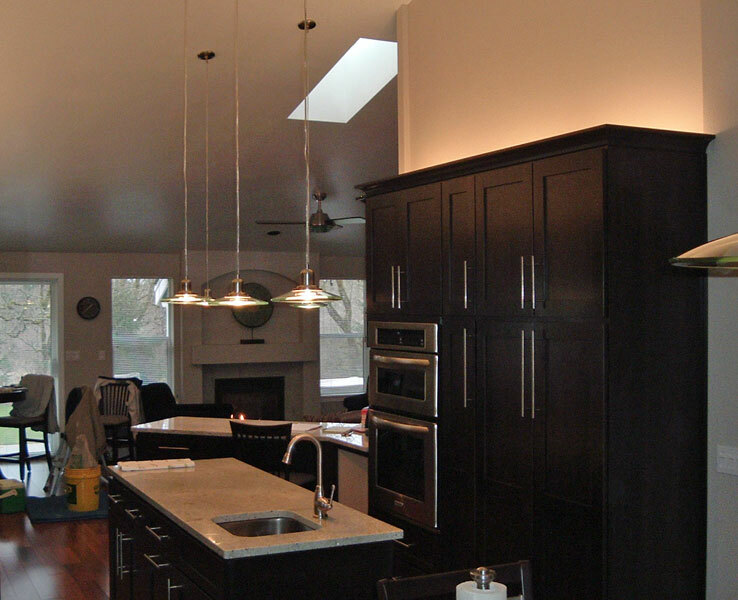 The tall stainless steel oven vent stack, the long drop lighting, the tall glass doors, and the abundant cabinet lighting (both under and on top of the cabinetry) help to further expand the space. 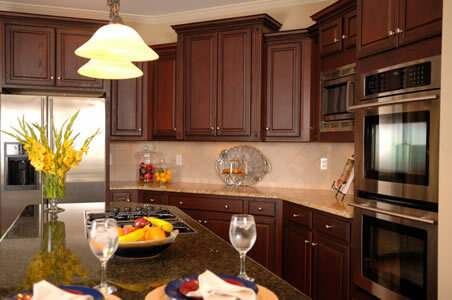 With all this room it was easy to include all of the amenities: A double wall oven, another oven and cooktop combination, a small sink in the island, an under counter wine cooler, under-mount soft close drawer-guides and pull out shelving help to make this kitchen an entertaining hot spot. 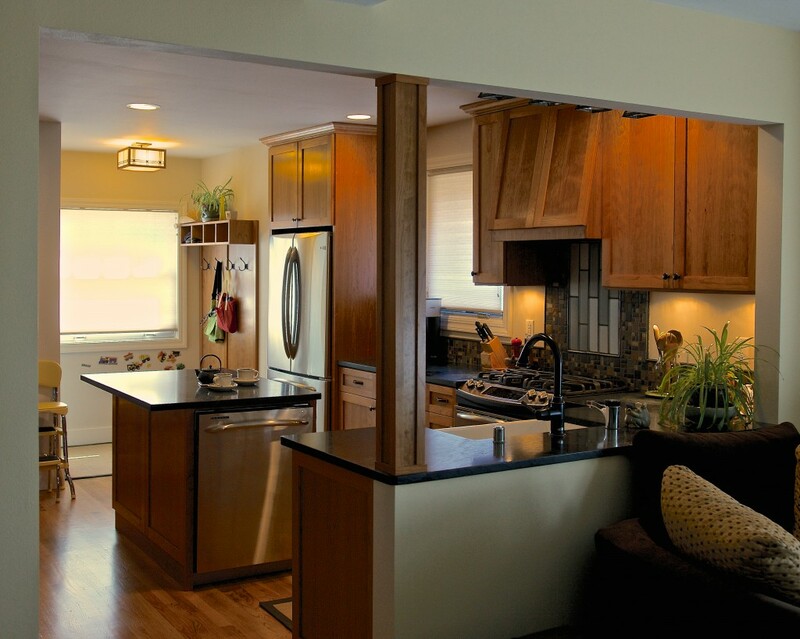 This is a project in which we were asked redesign the space to provide a more open feeling and expand the functionality of the kitchen. 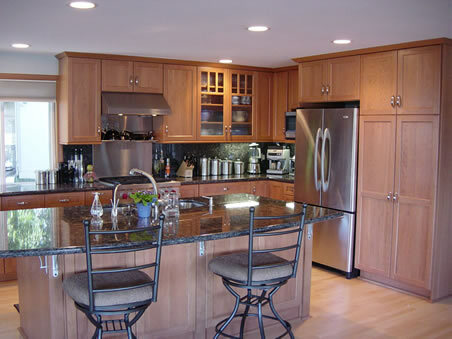 The space was originally cut up into two seperate spaces with countertop and hanging cabinetry jutting into the middle of the room; making for a very cramped space. 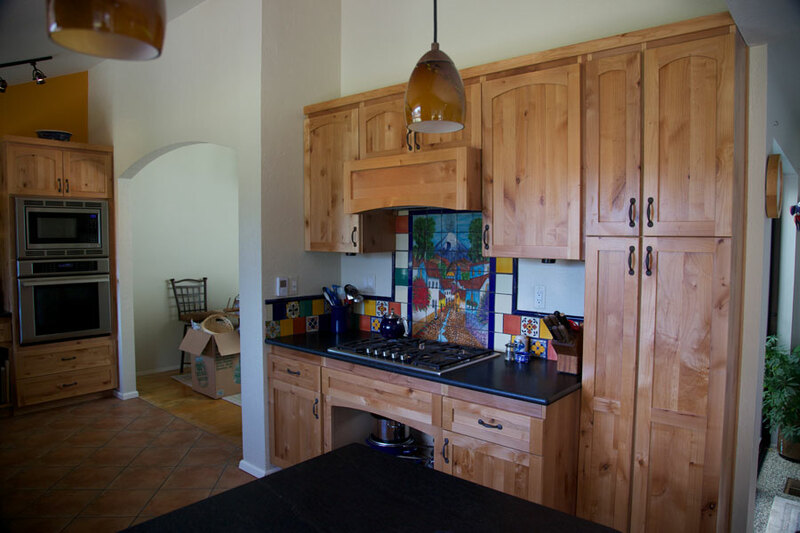 By removing the obstruction from the middle of the room as well as a few architectural changes we were able to create an open light filled space providing a perfect canvas for a Mexico inspired design. 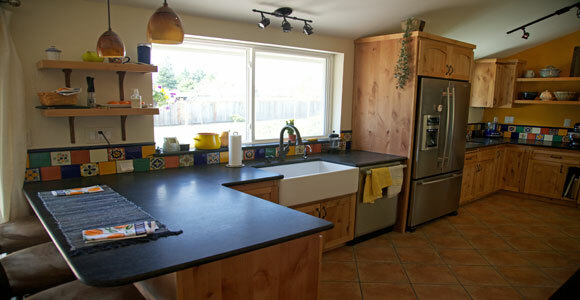 A separate baking area with a second sink, a wall oven/convection microwave combination, and heated tile flooring are some of the many features built into this sunny kitchen. 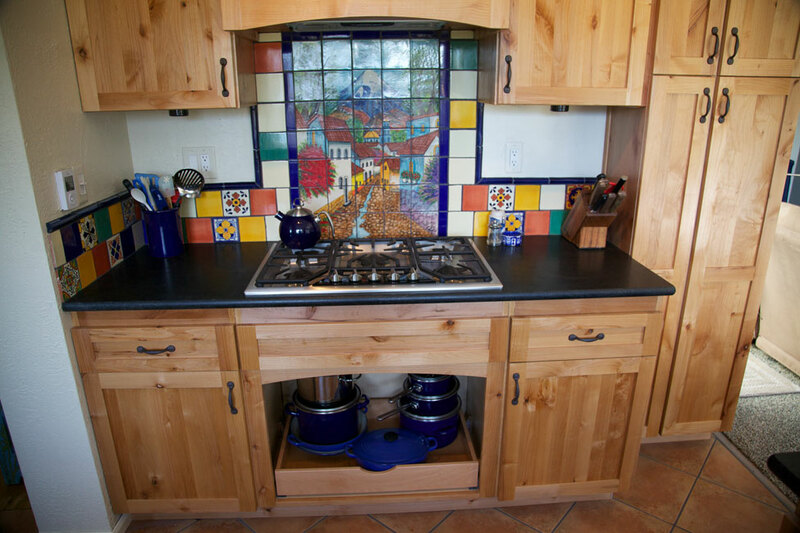 Viva La Cocina! 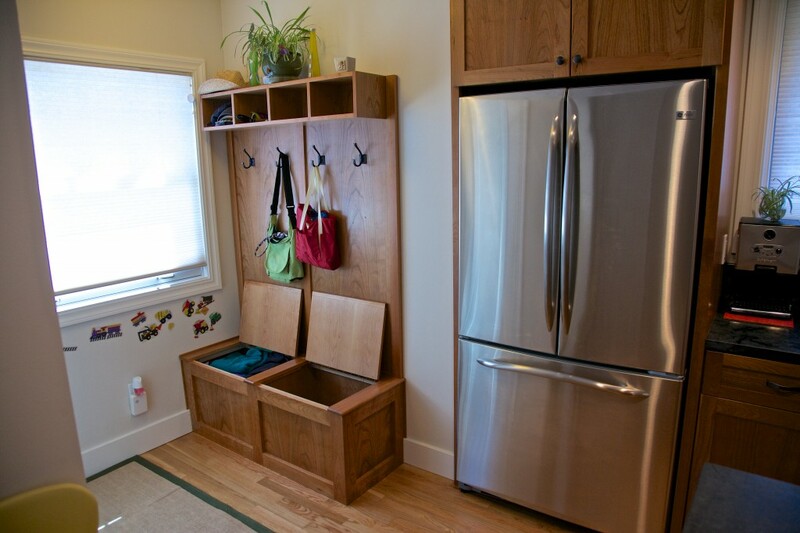 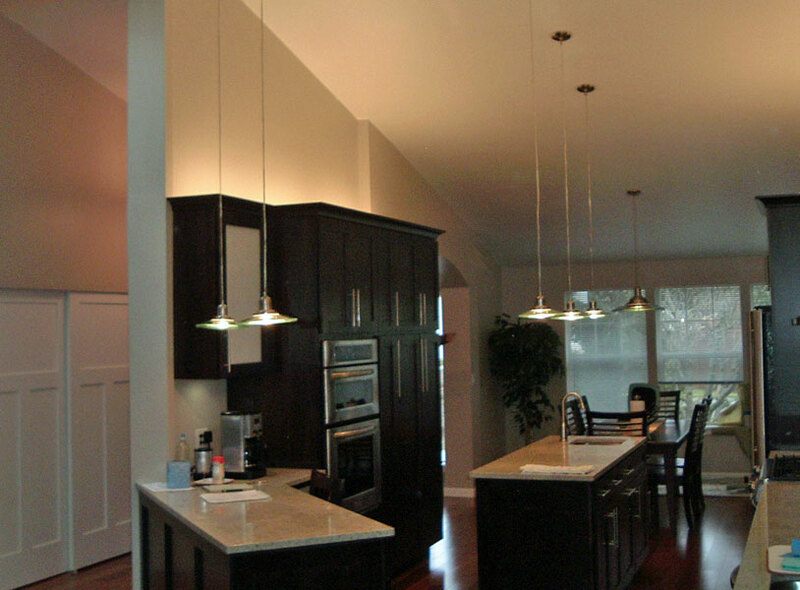 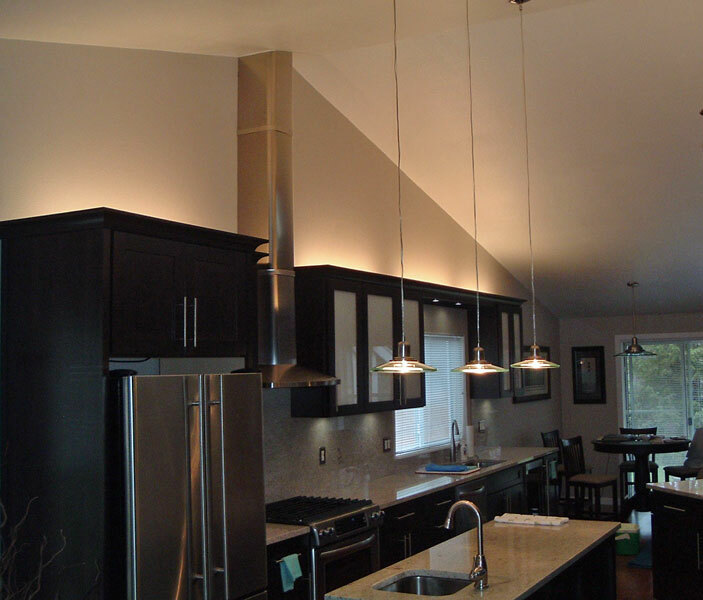 This was a project with some nifty design moves that provided for a sense of elegance and more usable space. 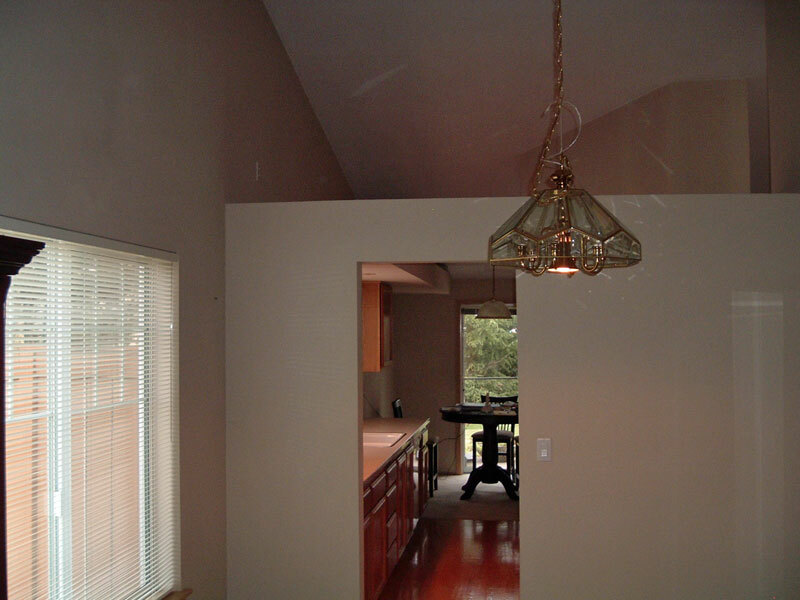 First of all a drop ceiling was removed and raised to a more comfortable height, and the "popcorn" texture was removed from adjoining family room. 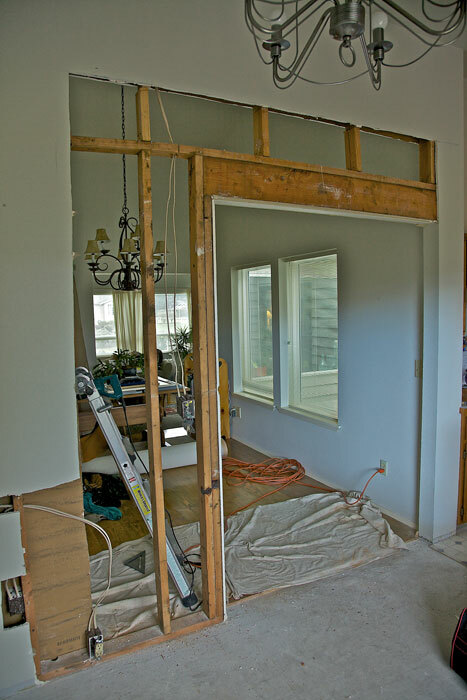 An old pass through to the dining room was walled up and a blank wall opposite the sink was moved borrowing space from a seldom used formal living room to provide a new space for the refrigerator and a wall of floor to ceiling cabinets. 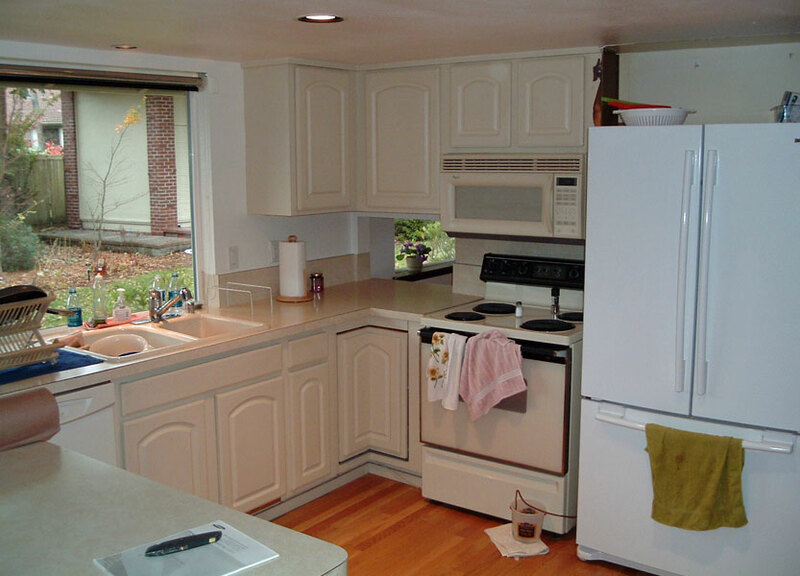 The Microwave is also hidden behind these cabinet doors. 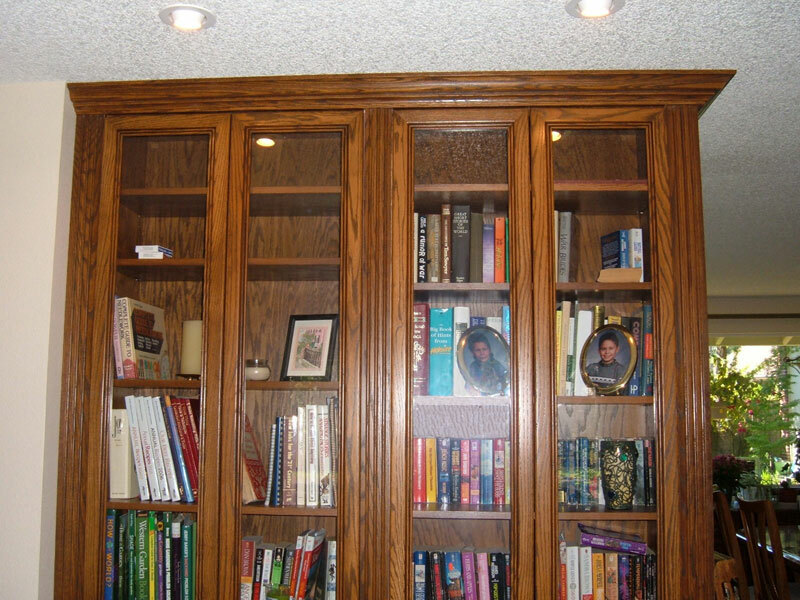 A new custom built bookcase was built and integrated into the changes made on the living room side of the refrigerator wall. 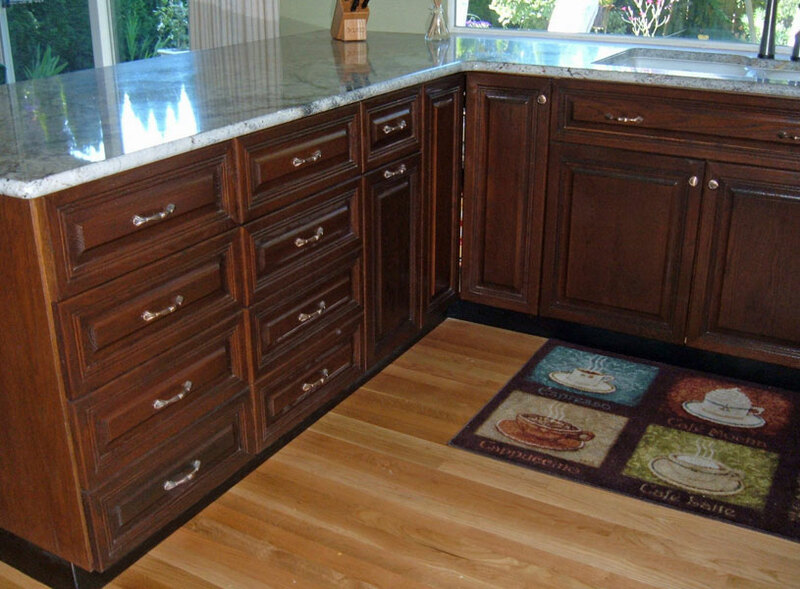 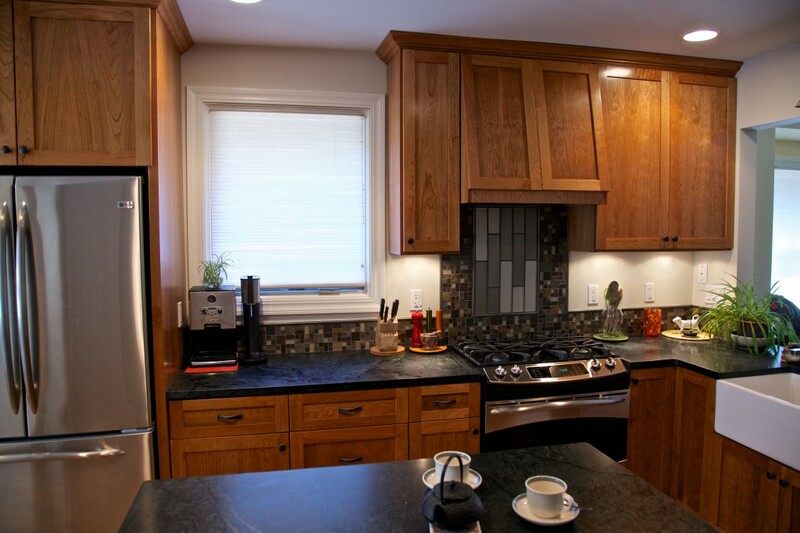 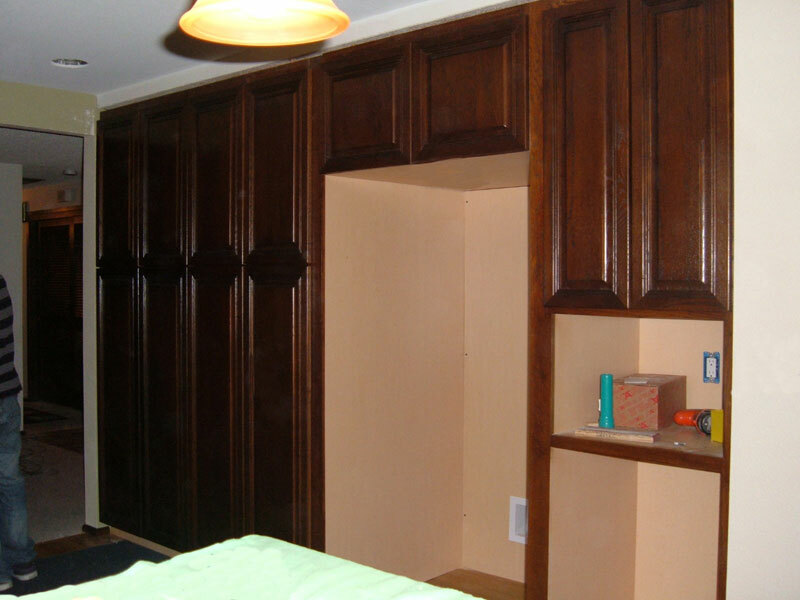 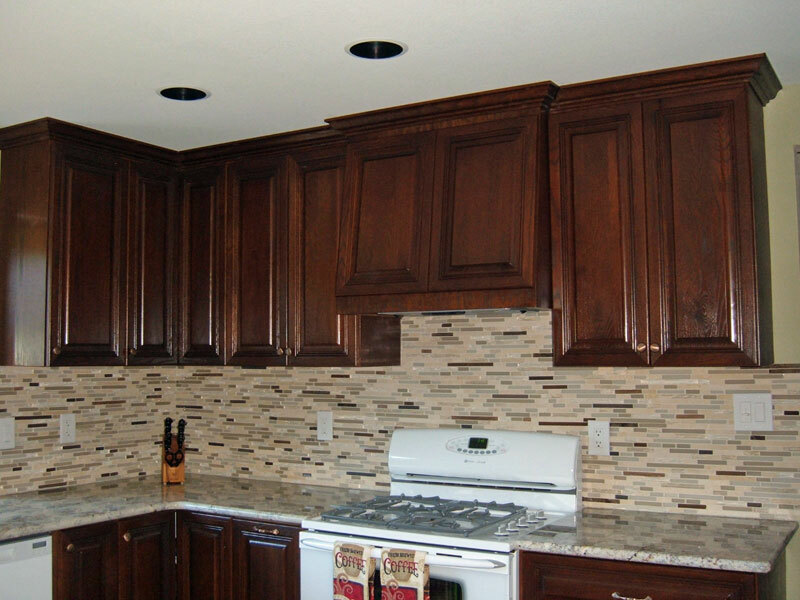 Custom oak cabinetry was built and stained a dark Mocha. 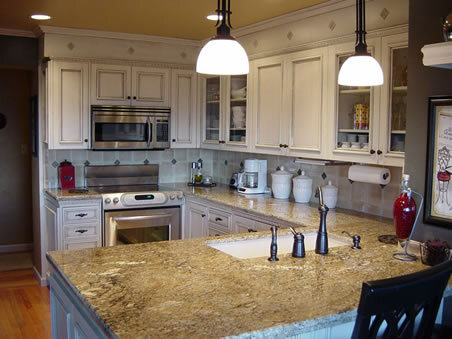 Granite counter tops, tile back-splash, under-mount sink, new lighting, pull out shelving, hidden garbage can, and new appliances are just some of the features that made home owners dream kitchen a reality. 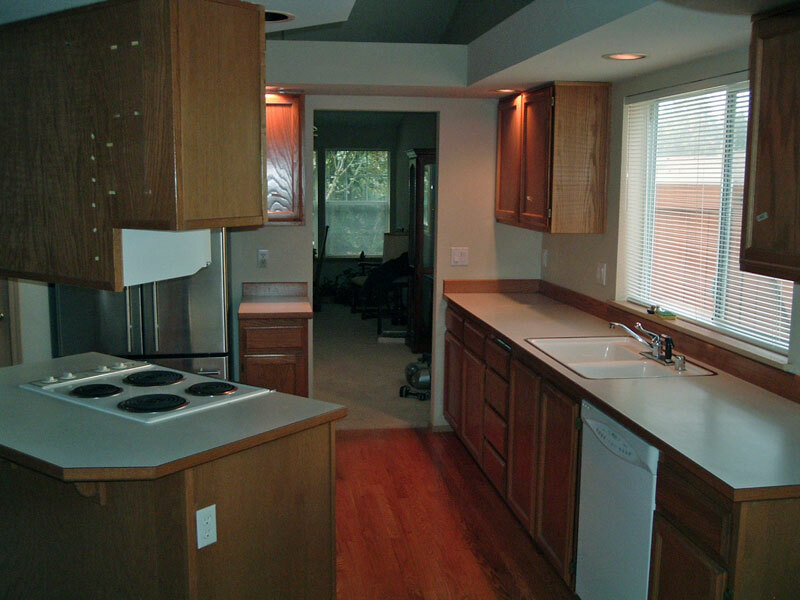 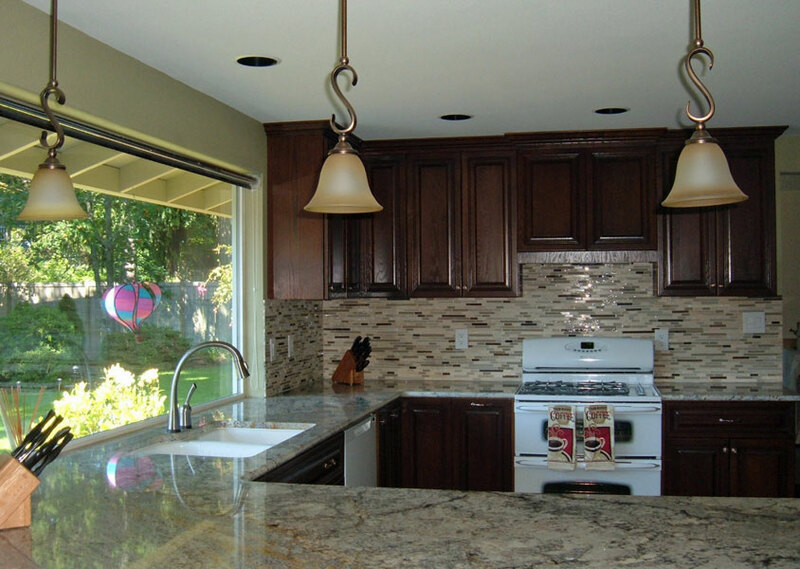 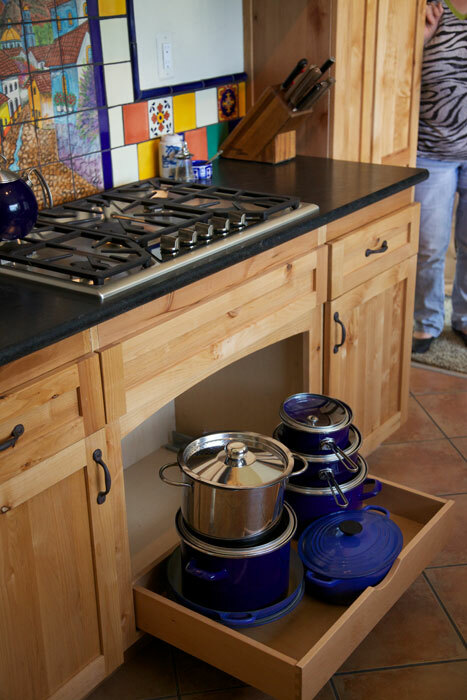 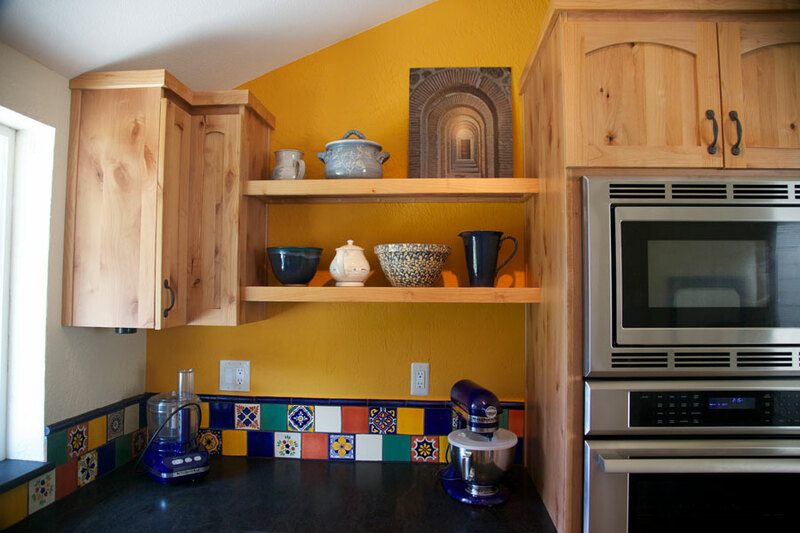 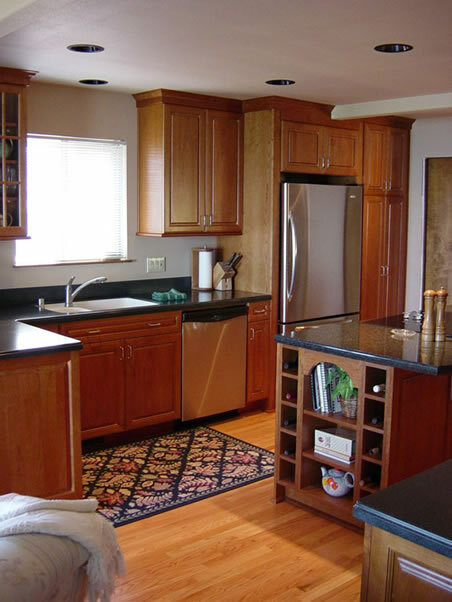 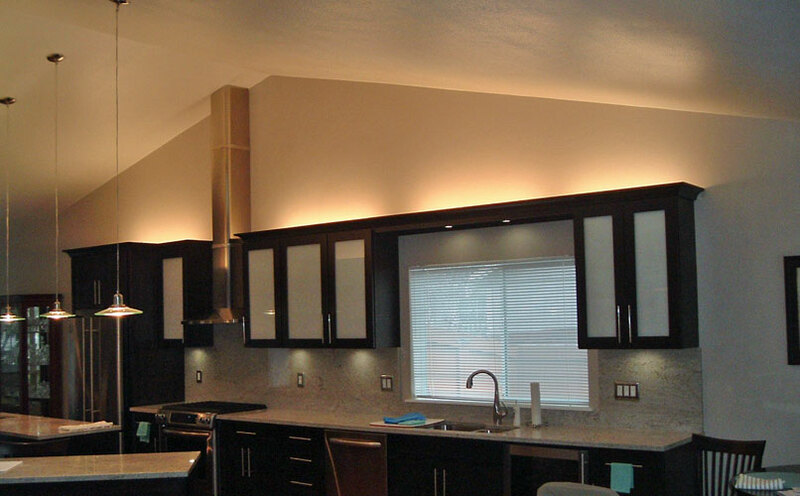 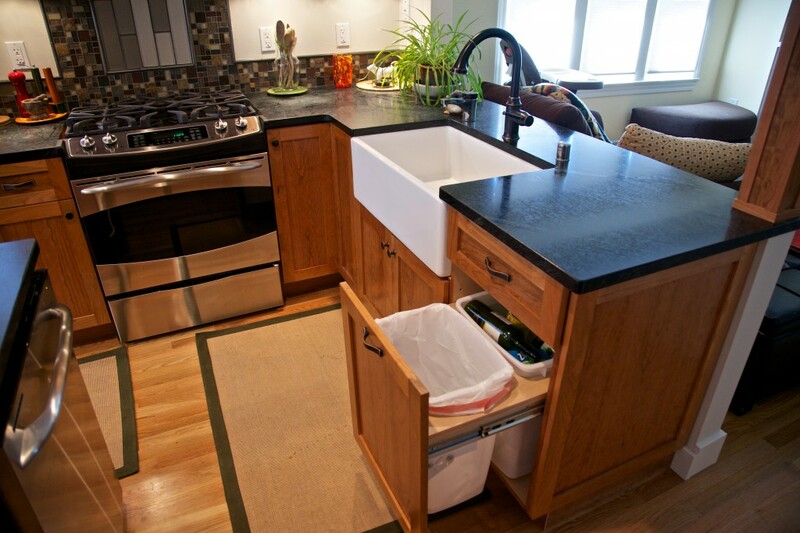 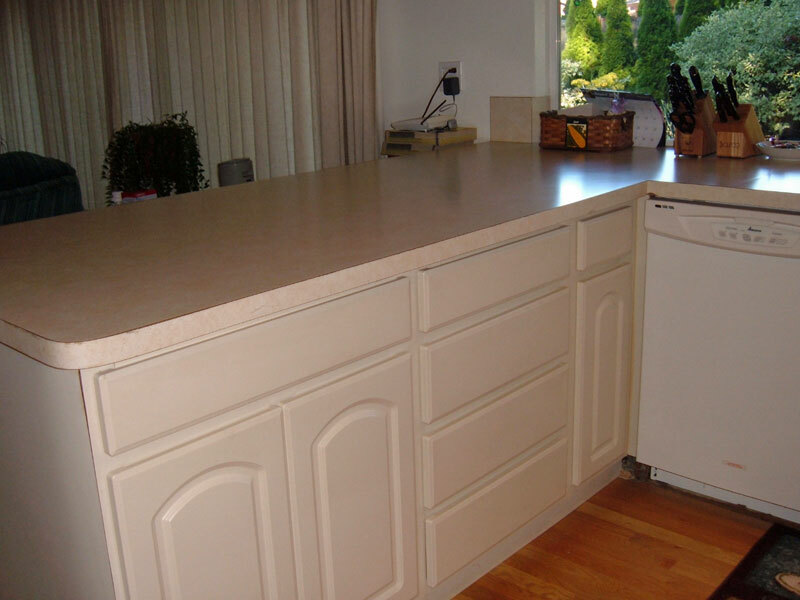 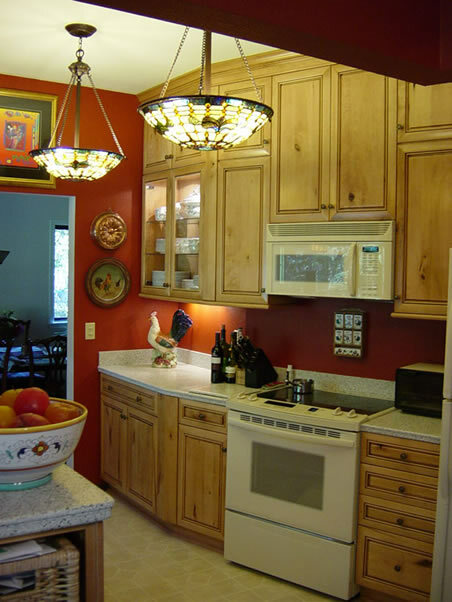 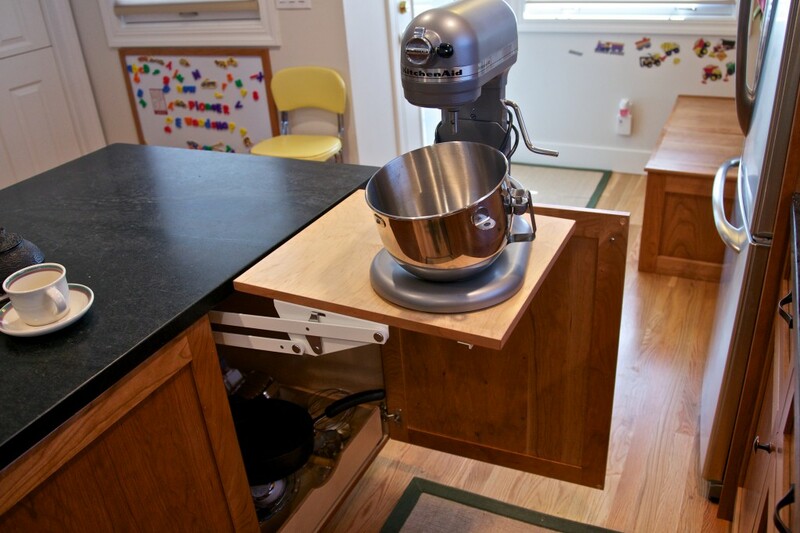 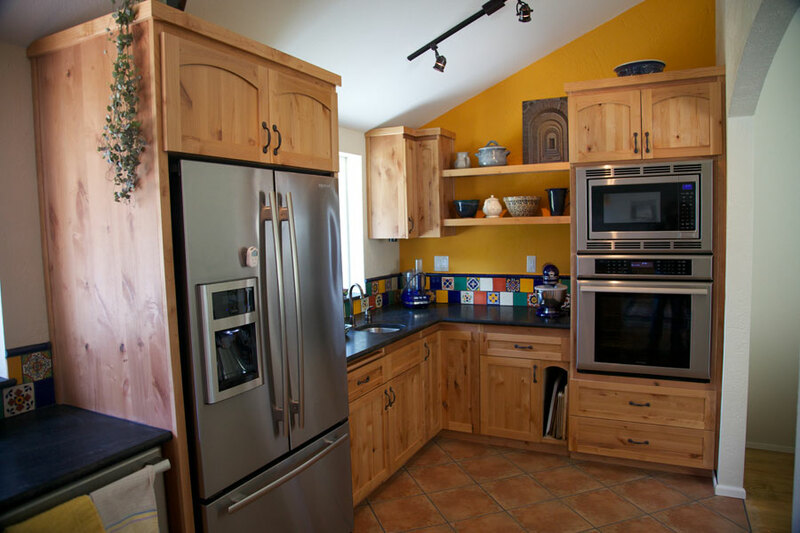 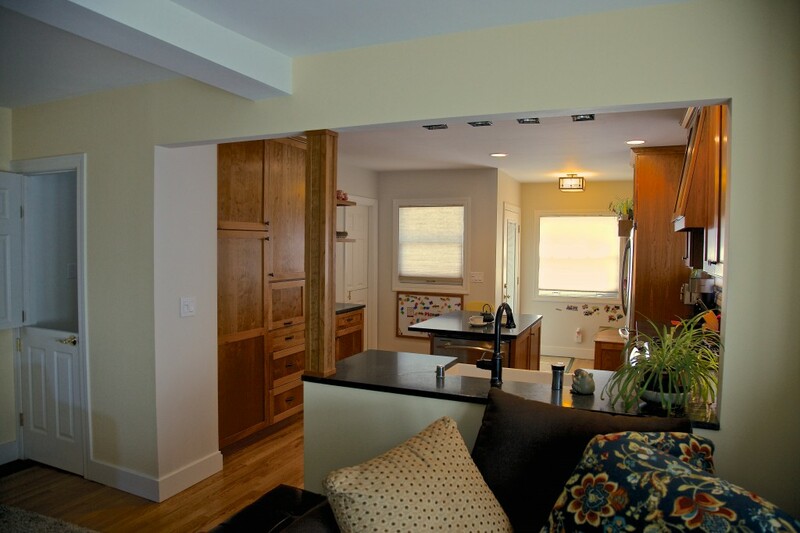 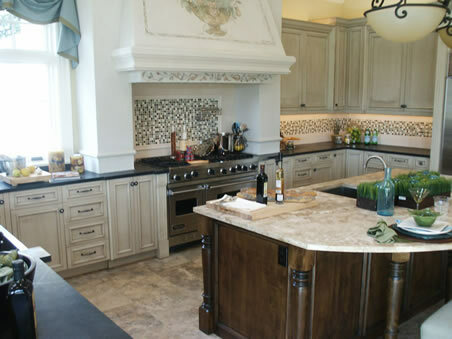 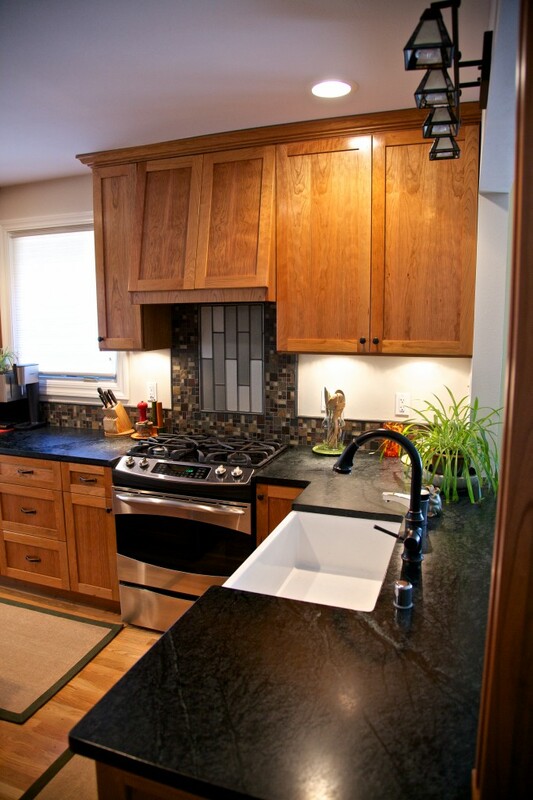 Here is a collection of previous kitchen remodels for the gathering of ideas.